This Underwater Camera Cover Kit from Outex comes with everything you need to use most full-body or battery-grip cameras underwater or in challenging conditions like driving rain or blowing sand. It has a large-sized, tripod-compatible silicone cover that measures 6.3" wide, 6.7" high, and 12.2" from the back of the camera to the front of the lens. It also includes a tripod adapter, a front glass port for a 67mm lens, a rear glass port for the viewfinder and LCD screen, wrist and neck straps, and the harness to which the straps attach. The Outex 130T Large Tripod-Compatible Underwater Camera Cover is designed for use with most large-body and battery grip cameras. Measuring 6.3 x 6.7" with a maximum body-plus-lens length of 12.2", the stretchy, silicone-based cover allows for mounting the camera on a tripod with the separately sold adapter. It has openings for an Outex Front Glass which is attached to the lens, and a Rear Glass which is attached to the tripod mount. The camera controls can be operated through the cover. The Outex Wrist Strap provides an alternative to a neck strap that still keeps your camera securely attached. The strap snaps onto the Outex Strap Holder LCD, the harness that fits on a camera inside an Outex underwater camera cover. This Neck Strap attaches to the Strap Holder LCD on an Outex underwater camera cover system. The padded strap has an adjustable length, and snaps easily on and off with side-release buckles. 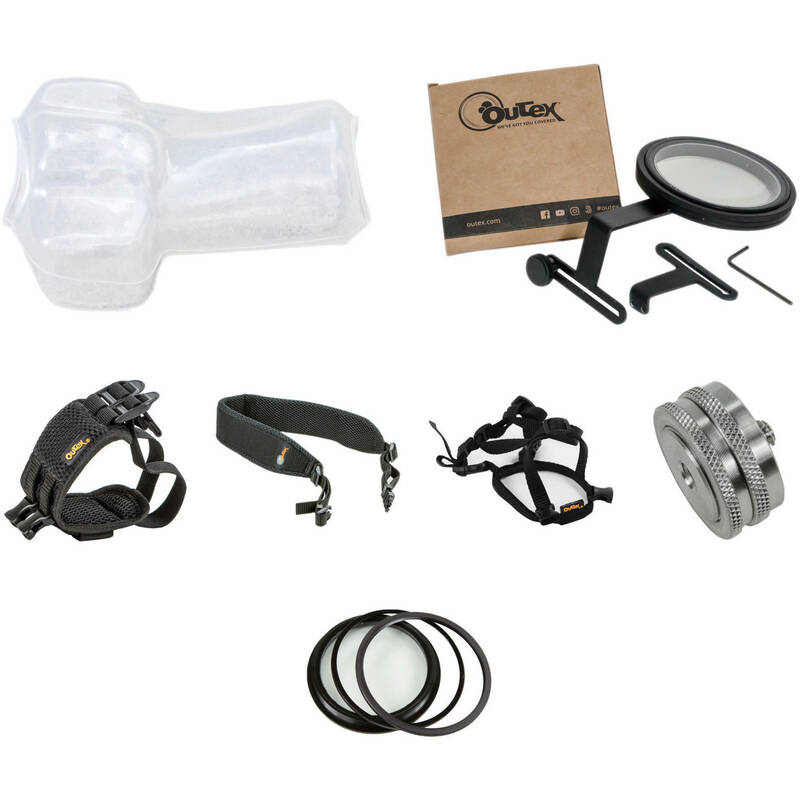 This Strap Holder is part of an Outex underwater camera cover system, and provides connection points for the Outex Neck Strap. The adjustable harness is equipped with side-release buckles for quick and easy attaching and detaching of the strap. This Rear Glass is compatible with any medium or large Outex silicone underwater camera cover. It attaches to the tripod mount on the underside of the camera, and its adjustable bracket allows you to place the 86mm lens where you can best see your LCD and/or viewfinder to operate your camera's controls. Simply pull the rear opening of the camera cover over the lip of the rear glass, slip on the O-ring, and thread on the outer ring to form the seal. These rings are made from anodized aluminum for durability and corrosion resistance. The assembly is depth-rated to 33'. This Tripod Adapter enables the use of an Outex underwater camera cover with a tripod. Using the 130T camera cover, attach the adapter to the camera, put the edge of the opening over the lip of the adapter, slip on the metal O-ring, and tighten the metal outer ring to create the seal. This Front Glass is compatible with any Outex silicone underwater camera cover. It screws onto any 67mm filter thread like a filter. Simply pull the front opening of the camera cover over the lip of the front glass, slip on the O-ring, and thread on the outer ring to form the seal. These rings are made from anodized aluminum for durability and corrosion resistance. The assembly is depth-rated to 33'. Box Dimensions (LxWxH) 8.3 x 2.9 x 1.15"
Box Dimensions (LxWxH) 12.1 x 3.85 x 1.4"
Box Dimensions (LxWxH) 4.45 x 3.3 x 1.35"
Box Dimensions (LxWxH) 7.1 x 6.4 x 3.0"
Box Dimensions (LxWxH) 4.5 x 4.3 x 0.9"